Since the early seventies, the development of the automobile has been characterized by a steady increase in the deployment of onboard electronics systems and software. This trend continues unabated and is driven by rising end-user demands and increasingly stringent environmental requirements. Today, almost every function onboard the modern vehicle is electronically controlled or monitored. The software-based implementation of vehicle functions provides for unparalleled freedoms of concept and design. However, automobile development calls for the accommodation of contrasting prerequisites - such as higher demands on safety and reliability vs. lower cost ceilings, longer product life cycles vs. shorter development times - along with growling proliferation of model variants. Automotive Software Engineering has established its position at the center of these seemingly conflicting opposites. 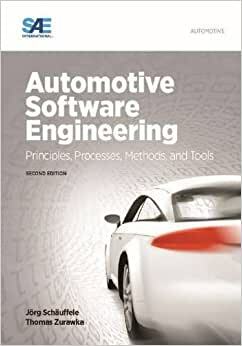 This book provides background basics as well as numerous suggestions, rare insights, and cases in point concerning those processes, methods, and tools that contribute to the surefooted mastery of the use of electronic systems and software in the contemporary automobile.